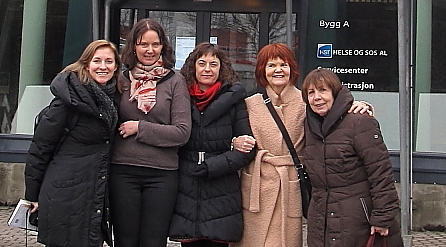 February 2015 saw the beginning of implementation of the Norwegian Financial Mechanism Programme 2009-2014-supported project Co-creating assistance for families living in communities – Assistance for families living in communities: co-creating the changes to reduce social exclusion and promote health. The project addresses social exclusion which is the issue that a rising number of Slovenian families are facing. The challenge lies in establishing cooperation with families who are unable to find the proper help within the existing programmes. The aim of the project is to activate the sources of family member and to encourage them to actively solve the situation they have found themselves in. The objectives of the project are to develop a model of providing assistance to families living in communities, to train professionals for social work with families, kinesiology and physiotherapy, to create the desired changes of families, to transfer the acquired knowledge into practice. The project will benefit families participating in the project, adults, participants in training programmes to enhance mobility and active lifestyle, students directly participating in the project, professionals and students, namely by transferring the results of the project into educational programmes. The inclusion of the Norwegian University is an opportunity to transfer knowledge to Slovenia and thus establish long-term cooperation between faculties. The University of Ljubljana – Faculty of Social Work, Faculty of Sport and the Faculty of Health Sciences – acts as Project Promoter with the Association of Friends of Youth Ljubljana Moste-Polje and the Norwegian partner Hřgskolen i Sřr-Trřndelag acting as project partners.